Please find below a copy of the schedule for Sunday 14yrs & over. NB. Senior Sparring schedule will be defined in the afternoon. Application forms should be received on or before 5th August to the National Team Email. On behalf of the Taekwon-Do UK executive, it gives me great pleasure to invite you to attend our Scottish Goodwill Open Championships. This Taekwon-Do event is open to coloured belt and Black belt competitors and is designed to unite TKD schools through our Martial Art of Taekwon-Do. These championships are a continuation of our successful International event held at Edinburgh for the previous four years, with a big emphasis on fair play and light contact for competitors especially junior divisions to encourage scoring points rather than causing injury to your respected opponent. ITF Scotland held an international grading this weekend in Montrose, under the grading panel of Grand Master MacCallum, Master McNairn, Master Campins and Master Blair. The competition was conducted in compliance with the AETF competition rules and the participants competed in the individual and team disciplines of Pattern, Sparring, Special Techniques & Power Test. The competition was open to Black Belt holders for competitors aged 13 years and above. The team travelled with 30 competitors, 11 coaches, 1 umpire, 1 IT assistant and 7 supporters. Arriving at their hotel for a successful weigh in on the Wednesday morning they then went on to some lite pre competition training at the Barada Centre. With an opening ceremony on the Thursday morning, the competitors and spectators were given a display of pre arranged sparring, patterns and contemporary dance, followed by the commencement of the event and the patterns category. The National team all performed well, scooping up 5 medals in total; (1 Silver, 4 Bronze). This is testimony to the hard work of team, with 7 competitors also reaching the quarter final stages. Following the event, the team had the remainder of the day to relax before returning home, and took in some of the sights the city of Maribor had to offer. The National coaching team will take a quick breath to plan ahead for the World Championships in 2019, with the selection process planned to take place in the near future. The Team would like to thank MIGHTYFIST EUROPE & MIGHTYFIST SCOTLAND, for their support and sponsorship. This has provided a massive contribition for our members. The Scotland ITF TaeKwon-do team are heading off to Maribor, Slovenia, to compete in the 33rd Senior & 24th Junior European Championships. We have thirty competitors, eleven coaches, two umpires and seven supporters representing Scotland in what promises to be a fantastic four day tournament. For the first time our team will be travelling with our full Migtyfist kit, thanks to the support of “Mighty Fist Europe”. We would like to give all our competitors our best wishes, and hope they do our themselves and country proud. ITF Scotland will host their annual International grading Exam for those who wish to promoted to 4th Degree and beyond on Saturday 21st April 2018 at DMMBA, Montrose. Those who wish to sit the grading should apply via the Secretary General on or before 31st March. The training session is open to any degree holder, times to be confirmed. It is with great pleasure that you and your students are invited to the forth Scottish Taekwon-do Alliance Junior competition. The competition will be held on Sunday, 29th April, 2018. This competition is open to all Taekwon‐Do students up to the age of 17 years from 10th Kup to 2nd Degree. Please take the time to read the following information and please contact the organisers if you have any queries. We look forward to welcoming you and your students to our third junior competition. Mr David Lupton 5th Degree. 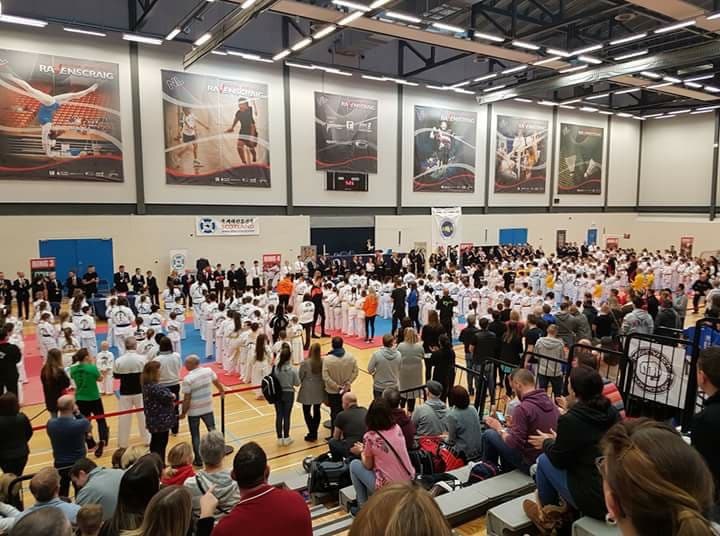 Over the weekend of 17th & 18th February, 34 clubs and 486 competitors took part in the 2018 National Scottish Championships, at Ravenscraig Regional Sports Facility in Motherwell. After the success of last years event, and a new two day format, it was repeated again this year, with a slight difference, as the children 13 years and under competed on the Saturday, and the Sunday was for competitors aged 14 and over. During the welcome speech on Sunday morning, a presentation was made on behalf of ITF Scotland Board to Ian Ford, ITF Junior Male Sparring -50kg World Champion 2017 as recognition of his win. ITF Scotland’s Honorary President Grand Master MacCallum was in attendance over both days, and presented trophies to the Overall Winners of each age Category. Congratulations to all medal winners. Full results can be found here. Under 7 years Male: Jakub Krug (GMAC Martial Arts). 2 Gold and 1 Silver. Under 7 years Female: Riley McPeake (Chimera Martial Arts). 3 Golds. 8 – 10 years Male: Lewis Nelson (Aberdeenshire Blackbelt Clubs). 2 Gold and 1 Silver. 8 – 10 years Female: Neve Orrick (TAE Jon Churchward School of TKD). 2 Gold and 1 Silver. 11 – 13 years Male: Alexander Bradwell (TAE Reflex Academy). 3 Gold. 11 – 13 years Female: Aishling Fitzpatrick (Inspiration Taekwon-Do). 2 Gold. 14 – 17 years Male: Antoine Zaugg (NTA – MWBA). 4 Gold. 14 – 17 years Female: Cailtin Hughes (GMAC Tollcross). 3 Gold. 18 – 35 years Male: Khalid Boualam (Scottish Martial Arts Centre). 2 Gold and 1 Silver. 18 – 35 years Female: Katie Humphries (NTA – MWBA). 2 Gold and 1 Bronze. 36 years and over Male: Richard Norman (Taekwon-Do UK). 3 Gold. 36 years and over Female: Sam Martin (NTA – MWBA). 2 Gold and 1 Silver. 1st Place: GMAC Martial Arts. 27 Gold, 25 Silver and 23 Bronze. 2nd Place: NTA – Boydell TKD. 16 Gold, 23 Silver and 24 Bronze. 3rd Place: NTA – MWBA. 16 Gold, 12 Silver and 10 Bronze. Thank you to our friends at www.handlesport.com for running our online registration once again this year. Next years event will be held on 23rd & 24th March 2019. Once again the venue will be Ravenscraig Regional Sports Facility, Motherwell. Please find below details of the Instructors course on Sunday 28th January 2018. Cost of course is £45. Participants must have completed Level 1, before applying for Level 2. Members can either do Level 1 or Level 2 as required, however cannot sit both Level 1 & 2 in the same day. You must pre-register for the course, no applications on the day. Child Protection section will be covered at a later date, due to course leaders availability, this will be advertised in due course. Appointments for the National Coaching Team for 2018/2019 have now been confirmed. Congratulations, and we wish you success in your new posts.